This is an amazing tray for its graphics and rarity. It is a very uncommon and early tray for White Label Guinness Stout. The tray is for Thomas McMullen & Co. who were American distributors to my knowledge. The tray features “PINTS” on one side and “SPLITS” on the other. The rim has a great deep emerald green with a little bit of fluctuation in the color. 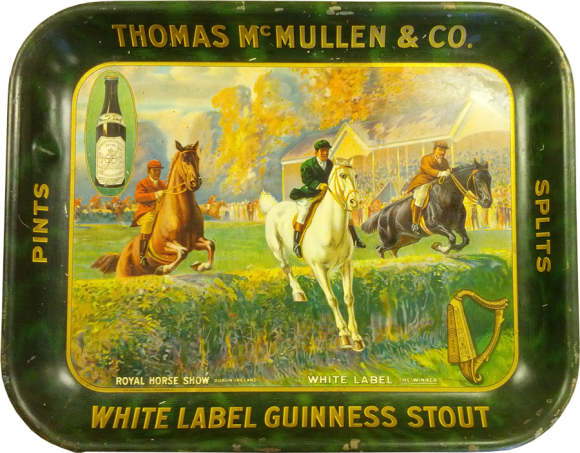 The main field of the tray is in great shape featuring a scene from the Royal Horse Show in Dublin, Ireland. The leading rider is on a white horse (for White Label Stout) with a jockey clad in deep green. The caption reads “White Label THE WINNER”. The upper left corner features a picture of the bottle and the lower right has the Guinness harp logo. The colors and style of the image are stunning and fantastic, a true gem of artistry combined with the reputation and history of the Guinness brand. 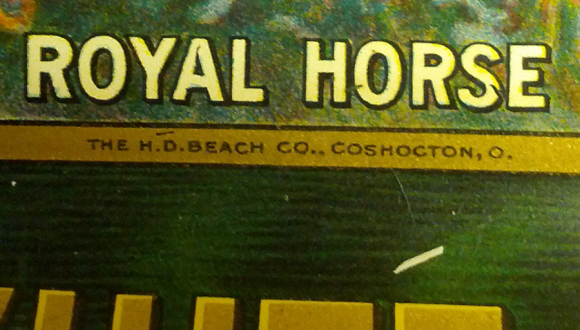 This tray was produced by the HD Beach Company of Coshocton, Ohio measuring at 10-1/2″ x 13-1/4″ and is a pre-pro tray.